Thank you for your interest in Powered Flexible Expanding Roller Conveyors. We will be happy to discuss the pricing in more detail with you please fill in your details below and somebody will contcat you back with a quote. Alternatively please call us on 01772 690656 and please reference our part number - Powered Flexible Expanding Roller Conveyors. Powered Flexible Roller Conveyors Total flexible conveyor control for high volume environments. With a robust construction, these expanding motor powered flexible roller conveyors provide cost effective flexible conveying solutions. They are easy and quick to manoeuvre in or out of trucks for more efficient, safer, easier loading and unloading. Motor power ensures a maximum 2 person operation on even the longest runs. Whether you need a flexible power roller conveyor available every hour or just a few times a week, these units will help you to reduce vehicle turnaround time and thereby increase productivity. They are ready to plug in and go right out of the box and there are also neat features that can be used to make boxes queue up on the conveyor before removal where products touching and pushing on each other might be undesirable. • Folds away when not needed. 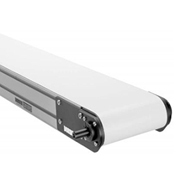 • Flexible conveyor control for high volume environments. • Robust frame construction. • Adjustable height legs. • Easy and quick to manoeuvre on swivel/locking castors • Helps to reduce loading or unloading time through reduced manpower. • Product queueing option available for fragile products.